Chico anchored off Eilean Mor, MacCormaig Isles. Chapel in foreground. ﻿ The fleet of Tall Ships leaving the Clyde was an impressive sight. Boats of all shapes and sizes turned out for the spectacle. Torrisdale Bay on Kintyre, looking accross to Arran. 'Lady Chico' takes a break at Torrisdale. We could have spent all week here, a deserted beach in a remote spot. The extraordinary volcanic plug that is Ailsa Craig, affectionately known as 'Paddy's Milestone'. Lamlash, looking more like Switzerland with Arran's mountains rearing up behind. 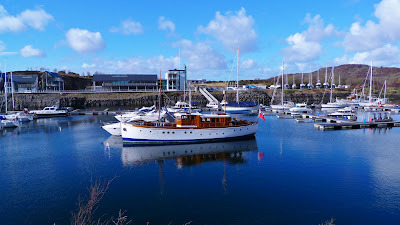 The start of June has brought more settled weather, allowing us to get on with some painting and varnishing while visiting some delightful spots in the Firth of Clyde. Although midsummer, the trees in the background have been damaged with salt spray from the May gale turning the foliage brown. This is a common sight on all west facing shores with deciduous trees worst affected but conifers suffering as well. Midsummer night, with one of the most dramatic skies that I've ever seen. Heading south from Loch Gair to Great Cumbrae we enjoyed the spectacle of 40+ yachts racing around marks between Tarbert and Portavadie. It seemed more like The Solent than Loch Fyne. Loch Gair, just north of Lochgilphead, was just the place to ride out the unseasonal May storms. It's a small circular loch that is only open to the east. The folly on the point was built in the 19th century by the local laird in the fashion of the day. Looking north to Stonefield Castle on the west shore of Loch Fyne, this anchorage has good shelter from the west and north and lovely views down Loch Fyne. 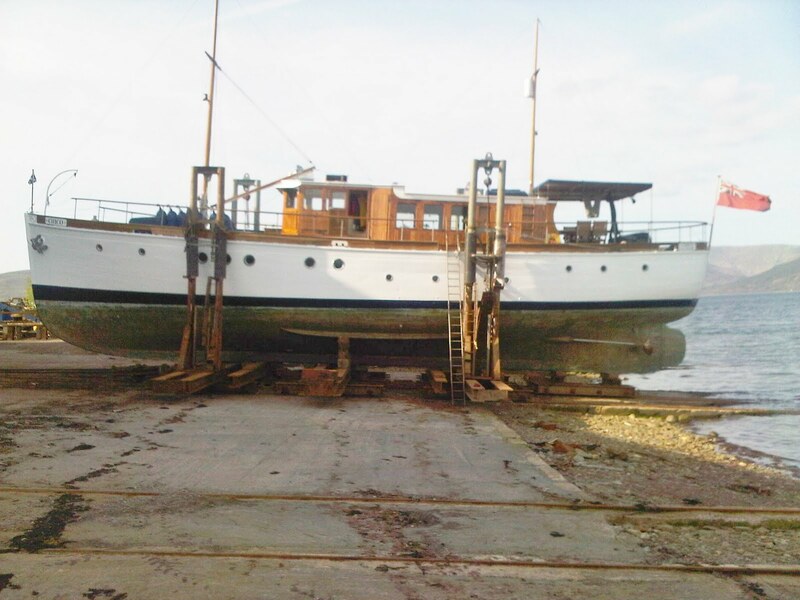 Over Easter we took Chico out of the water﻿ at Ardmaleish Boatyard on Bute for some maintenance and a repaint. Two days spent cleaning up the copper sheathing and props have paid off, giving us nearly 2 knots in reduced drag. 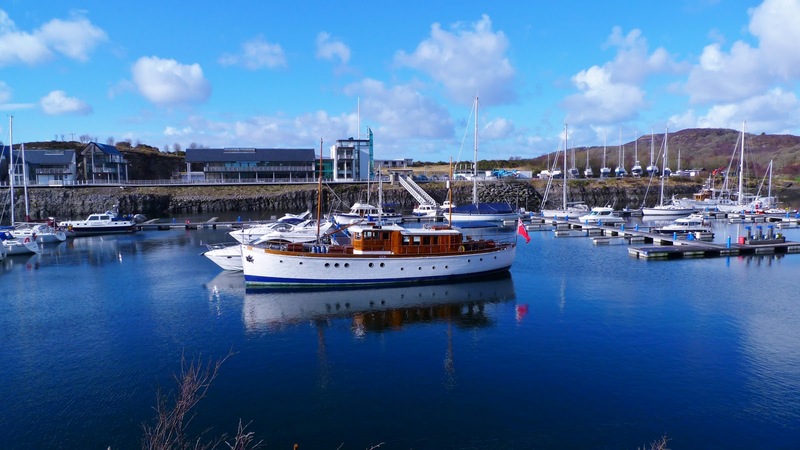 We left Portavadie Marina during the first week in April, steaming south past Arran on our way to Rothesay through a flat, oily sea. 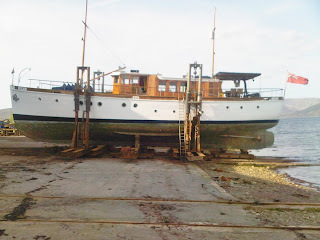 In Spring, a boat owner's thoughts turn to.........varnishing! 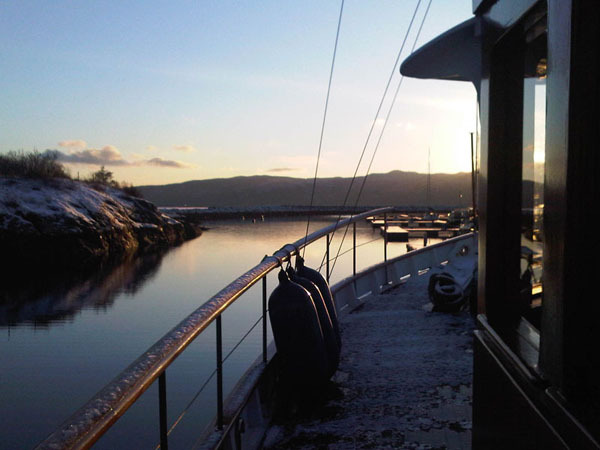 This winter we're berthed at Portavadie Marina, on Loch Fyne. Beautiful, sunny and still, if a little cold! Our only outing so far has been across the loch to Tarbert to give the Gardners a little exercise.